About 1 ¾ miles up Jane’s Scenic Drive just after the first bend there is a distinct ecotone where the prairie on either side abruptly transitions to forest. You’ve entered Fakahatchee’s strand; the world’s largest subtropical strand swamp and a geological feature unique to southwest Florida that provides habitat for many threatened or endangered species. Technically a strand is simply a shallow, water-filled channel in which trees are growing. But it’s more than that. The Strand’s canopy moderates extremes, creating a microclimate that retains humidity, making it just a little bit cooler in the summer and a little bit warmer in the winter. This in turn allows a rich community of native bromeliads, ferns and orchids to flourish; it literally drips with life. 180 yards beyond the entry into the Strand, where a culvert passes under the Drive, there’s a small semicircular pond on the right that provides a window into this world. It’s worth pulling over to dwell a while, but best to go on some 20 yards and then double back on foot so you can approach slowly and quietly. A broad slough spills out of the swamp here before it is channelled under the road. On this windless early January day mottled grey pop ash trunks and a blue sky were perfectly reflected in the pool below. Despite the Sun’s glare I could see a school of sailfin mollies (Poecilia latipinna) close by, hanging almost motionless in the 2 foot deep, tea-colored water. This robust native fish is the same that is often chosen for home aquariums, probably because they can tolerate a wide spectrum of conditions from low oxygen to high salinity. Their natural range is a crescent from North Carolina around through Texas to Mexico’s Yucatan, including Florida. Sadly someone thought it would be a good idea to introduce them to California’s hypersaline inland Salton Sea. A perfectly benign species here is now out-competing the endangered desert pupfish (Cyprinodon macularius) there. We can’t leave well enough alone. Beyond the mollies but still beneath the surface are feathery patches of bladderwort (Utricularia inflata). The whole plant is submerged with only their yellow buttercup-like flowers poking above the surface. Their flimsy roots do little more than serve as anchors. The plants absorb what nutrients they can directly from the water through their thin cell walls. But the slough’s acidic waters are nutrient poor. Like some other bog and swamp plants, the bladderwort has evolved a means to supplement this pathway by exploiting the ready availability of essential biochemicals in animal tissue. It is carnivorous. Some of its leaves are modified into bladder-shaped traps to ensnare passing zooplankton and even small fish hatchlings. These operate like the compressed bulb of an eye-dropper. Minute hairs around the bladder’s mouth are touch sensitive. When stimulated they cause the bladder’s walls to relax, sucking in passing prey that is then slowly digested. At the back of the pool is a rhizomatous mass of emergent vegetation between a wall of heavily buttressed pop ash trunks. Their buttresses probably serve a similar function to those of cypress trees, helping to absorb oxygen. Today this part of the Strand is a pop ash swamp, but it wasn’t always so. These trees would have been an understorey species before the cypress was logged. Even though logging ended almost 60 years ago the damming affect of the road and the culvert’s channelization has probably kept the water high enough at this particular spot to prevent cypress seedlings from establishing. It’s very hard to undo man’s work. Something caught my eye at the back of the pond; an almost imperceptible out-of-place shape. The principles of camouflage and concealment from my army days (shape, shine, shadow, sound, movement and color) came seeping back into my mind as I peered harder. Yes! I could just make out an alligator’s eye ridge barely above the surface. Nearby a darker crouched shape attracted my attention. It was a little green heron obscured behind a tangle of leaves. It slowly emerged, picking its way towards the hidden gator. I suspected that they were both aware of each because it foraged just so close, then changed direction. And when it did so, the gator, now discovered, moved out a little into the open pond to expose and orientate the bony scutes along its back to the Sun and warm up. If dinner was out of reach, there was no point in being cold. But most notable was that midway up the pop ash trunks, amongst the narrower-leafed cardinal airplants (Tillandsia fasciculata), a scattering of giant airplants (Tillandsia utriculata) still hung on. These bromeliads are ecosystems in themselves. Their aerial ponds support a microcosm of life. Sadly these giant tank epiphytes are an increasingly rare sight due to the depredations of the Mexican bromeliad weevil (Metamasius callizona) – an invasive exotic. This so-called evil weevil arrived in Florida from Mexico on imported ornamentals. The giant airplant is particularly susceptible because of its ‘big bang’ reproductive strategy. All our other native bromeliads reproduce both asexually (typically by pupping) and sexually. The giant doesn’t propagate vegetatively at all, and only flowers once in its 10-20 year life span, after which it dies. That’s a long time to be susceptible to the weevil with plenty of opportunity for infestation before reproducing. If it does successfully reach this stage, the giant airplant pushes up a huge flowering shoot over 6 ½ feet high in a final burst of energy. This may ultimately bear 10,000 seeds which are then dispersed on tiny wind-borne parachutes. Several stages of the weevil’s life cycle may be busy eating away various parts of the plant at the same time, but the death blow is when their larvae bore into and shred the plant’s stem tissue to build cocoons. The answer may be biological control. A lot of work has been done on an imported parasitoid tachinid fly, Lixadmontia franki. After extensive testing these have been released in small numbers but rearing them in sufficient quantities has been problematic. You have to have bromeliad weevils for them to prey on and these then need bromeliads to feed on. They’ve tried using trays of pineapple tops leftover from supermarkets for the latter, but the process isn’t completely cracked yet. 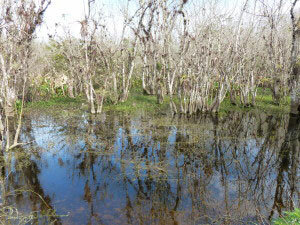 The weevil’s devastation has been progressing inexorably southward through the Fakahatchee. But I’m an optimist and like to believe that perhaps the solution lies here in the bromeliad’s gene pool by our little pond. Maybe the random genetic shuffle of sexual reproduction has produced a combination that is somehow resistant in this location. We’ll have to keep observing. Another possible salvation might be giant airplants surviving in isolated hammocks or cypress domes. The weevil is a weak flyer that travels from branch to branch rather than over long distances and perhaps these reservoirs may serve to repopulate the Fakahatchee in the future. My thoughts returned to the scene before me and my eyes moved upward to the grass-like tufts of reddish-tinged southern needleleaf (Tillandsia setacea) higherin the trees. Behind them I could just make out the white blotches of several roosting egrets. As I lingered I heard the plop of a fish, then the mutterings of some herons and finally the flap of wings. I turned to leave. On the other side of the road, a limpkin was patiently stalking over some logs floating in our slough which continued ever so slowly to carry the Strand’s waters towards the sea. All this in a fifteen minute stop – that’s the Fakahatchee!